Summary: At Brandon’s final student senate meeting, Alex and Janice surprise the president with a cake and a visit from his parents and friends. They also encourage him to run for another term. He agrees to serve again, even though he knows it’s crazy. Valerie is suddenly interested in Brandon, and she wonders how close he and Kelly are. David offers to help Brandon with his campaign, but he doesn’t plan to do much, mostly since he’s running unopposed. Valerie packs a picnic for Dylan, but Charlie keeps her out of the house, since Dylan’s having a session with Dr. Campbell. Dylan regresses to the Old West, where he’s a robber named Billy McCoy. While robbing a stagecoach, he flirts with one of his victims, who looks like Kelly. Then things get even more ridiculous when Billy starts narrating. He and his partner go to a saloon, where a guy recognizes Billy from a wanted poster. Billy starts shooting and takes a bullet in the shoulder. Dylan tells Dr. Campbell that he’s enjoying reinventing himself. Billy goes back to the saloon another time and hooks up with a singer, Dixie. She tells him he’s “the real McCoy.” Gaaaaaag. Billy looks out the window and sees the girl who looks like Kelly. Brandon wants to have his victory party at the After Dark, though he tells Nat he doesn’t need to campaign. Nat teases him for being so humble. Charlie tells Valerie that as crazy as the regression therapy might seem, it’s very real when it’s happening. Billy and his partner pull off a bank robbery, but Billy’s confronted by a guy he shot during the stagecoach robbery. There’s more shooting, Billy shoots someone, and another guy gives him a guilt trip because he shot a guy with a family. Billy drinks at the saloon and rejects Dixie when she asks him to spend the night. He goes outside and watches his friends torment an Indian. Dylan flashes back to the sweat lodge, then goes back to his regression, making his friends leave the Indian alone. Old West Kelly sees this and praises Billy for being a good guy. She thinks he can become a better person. Billy and Old West Kelly are suddenly in love, but Billy’s friends are upset that he’s not a bad guy anymore. He forgot that they were all supposed to rob a train together. Billy assures his friends that he’ll be there, but Dixie overhears and knows something’s up. 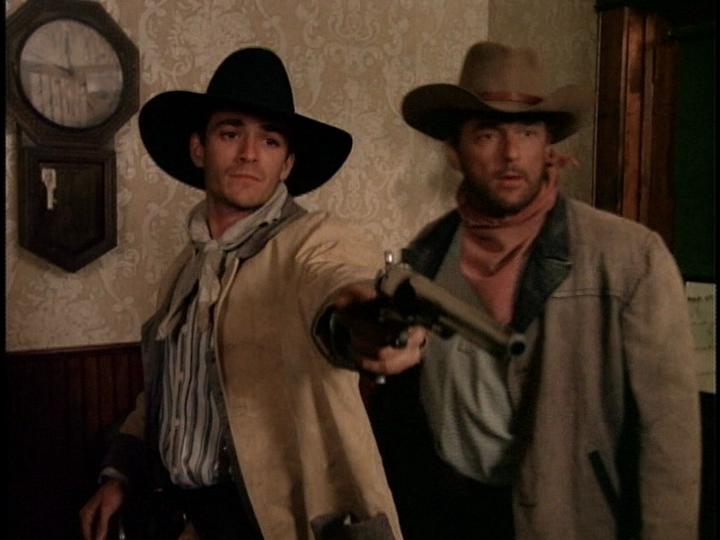 While the other guys head toward the train, Billy leaves town with Old West Kelly. Charlie and Valerie come over after the regression session (hey, that rhymes! ), and Dylan yells at Val that he found out that he was on the path to Hell until Kelly came into his life. Apparently Dr. Campbell thinks Dylan and Kelly’s link is “seminal.” Charlie deciphers this to mean that Kelly and Dylan are soulmates. Meanwhile, Jim is still worried about his job. No one cares. Brandon got an endorsement from the Condor, so his candidacy is pretty much a done deal. Valerie asks Brandon if he thinks he has a soulmate, and if he does, is it Kelly? Brandon says he sees a future with her. He thinks Val and Charlie are interested in each other. Valerie complains that Kelly’s trying to turn everyone against her. She reveals that when she first moved to town, she told Kelly that she was going to make Brandon see her as more than a sister by the end of the year. Valerie continues that she and Brandon have never touched each other; they’ve never even given each other a high five. She hopes Kelly appreciates what she has. Brandon does, too. The he hugs Val, and I can’t believe Kelly didn’t walk in and see that. At the beach apartment, Donna tries to round up David and Clare for sushi and bowling. They’re on board until they find out Ray’s also coming. Clare quickly comes up with a prior engagement they totally forgot about until just now. (Well played, Clare.) Donna’s disappointed (what, that your friends have other friends? ), and Ray calls them on the bluff after she leaves. “How’s Valerie?” Clare asks, actually making me like her for once. Brandon prepares for an interview on CU’s news show, CU Later, and Clare warns that the interviewer has something up his sleeve. The interviewer catches Brandon off-guard with a question about a tuition increase. Brandon takes the question to a dean, worried because the election is tomorrow, and he could be blamed. In fact, he’s being slammed by Janice and Alex for not going public with the increase (which Brandon didn’t know about). Alex is now running as a write-in candidate. Valerie flirts with Brandon, wanting to dance with him at his victory party. She also offers to stuff the ballot box. Kelly and Steve have a successful day in New York, and return to their hotel to find flowers from Dylan. In Beverly Hills, Dylan begs Dr. Campbell to regress him back to his happily-ever-after moment with Old West Kelly. He’s confused because those images don’t fit with how he feels about Kelly or himself. Dr. Campbell wonders exactly what they’re looking for but agrees to another regression. Back to the Old West! Except it’s a few years later, and Billy and Old West Kelly are married and have kids. (And Billy a mustache. It’s not working for me.) Also, Billy is a marshal, and he’s going by the name Jedediah. One of the robbers tracks him down to tell him that Dixie’s in trouble. Billy agrees to go with him to help her, though Old West Kelly is worried because Billy’s old gang doesn’t know what he’s like now. The two of them say goodbye, knowing they might never see each other again. Billy rescues Dixie, unknowingly having his life saved by an Indian who knocks down a guy trying to shoot him. Billy takes Dixie to the train station, and as she’s about to leave for San Francisco, Billy’s shot by the son of a man he killed. From Billy’s grave, Dylan sees that some of the people at the funeral are Brandon, Donna, and the real Kelly. Dr. Campbell tells him that this might actually be a premonition. Dylan remembers going to a palm reader who told him he doesn’t have a long life line, so he needs to make the most of his time. Brandon loses to Alex, so the victory party at the After Dark isn’t to celebrate anything. On the bright side, Brandon doesn’t have to deal with anyone’s complaints about the tuition increase. Jim: still worried. Jesse tells Andrea that he’s been offered a teaching position at Yale Law (I BET), and negotiated a spot for Andrea as an undergrad. Kelly calls the After Dark to talk to Brandon; Valerie remarks that it’s just her to call after the election is over. (Huh?) Kelly’s back in town, at the beach apartment, which is where Dylan finds her to give her big smoochies. A 15% tuition increase? No, no, no. You have to raise it, like, 3% at a time so people don’t realize how much they’re getting screwed. Dylan + mustache = Yosemite Sam. Okay, Dr. Campbell is clearly just making crap up. She’s not even good at pretending she knows what she’s talking about! “This could be a memory, but it could also be a premonition. But I’m not really sure.” Yeah, you’re just taking his money and telling him stuff that sounds good. Lolz Val threatened Kelly and BARELY made it through Dylan’s front door just to find out she’s no longer a factor.